Scarborough is Britain’s first seaside resort and over the last 360 years the many visitors have made Scarborough a very popular place for the young and the old. Scarborough has two lovely sandy beaches South Bay and North Bay which are separated by a rocky headland on which stands the historic Scarborough Castle. There are many attractions by day and night to fulfil your stay whether on holiday or just visiting for the day. There is a wide range of shops and ample restaurants serving a variety of fresh local produce catering for all tastes such as seafood, a la carte, Italian, Greek, Indian, Chinese, Thai and of course good old Yorkshire fish and chips never mind all the stalls selling fresh cockles, muscles, prawns, crabs and lobster all found along the sea front and in the town centre. South Bay is the busiest and with its large sandy beach and child friendly amenities it is very popular with families. During the summer the beach is overrun with children and adults building sand castles and the donkey rides are still as popular as ever. There are many boat trips to choose from going out from the harbour and the bay and this area was the site of an early medieval settlement and forms the current Old Town District. The historic Spa lies at the south end of the beach and heading north along the beach this is where you will find the amusements, arcades, seaside shops, cafes, fish stalls, ice cream stalls, restaurants and entertainment facilities. There is also a lift up the cliff side for easy access to the town centre. North Bay is the quieter end of Scarborough and also has a beautiful sandy beach to be enjoyed by all. To the north of this very pretty Blue Flag bay you will find the Sea Life Centre and just beyond is Scalby Mills. Inland from the beach is Peasholm Park which is well worth a visit and The Sands a new leisure development with an amphitheatre, lake, water park and landscaped parkland. There is also a miniature railway that runs along the North Bay which opened in 1931 and is one of the few railways in the country not to be nationalised. This 20 inch gauge railway is only seven-eighths of a mile long but provides ideal transport for anyone who wishes to visit the Sea Life Centre and the new themed golf course. Fishing from both bays can fetch billet, codling, flatfish, whiting and mackerel and crab fishing is very popular especially in the harbour in the South Bay. Scarborough Castle situated on the headland that rises 300 feet above sea level dominates the town and harbour. The castle was built during the 12th century and underwent many additions and improvements reflecting the scale and skill of castle building of that time. The castle has endured sieges from medieval kings and Civil War armies and German naval bombardment during the Second World War. The castle is open to the public and the views from the battlement platforms are outstanding. The opening times are seasonal and variable. There is an admission fee but is free for English Heritage members and with overseas visitor passes. In the graveyard detached from the 12th century St. Mary’s Church, not far from the castle entrance, is the grave of Anne Bronte who died on 28th May 1849 aged only 28. The Cleveland Way was opened in 1969, the second National Trail to open in England and Wales, and follows a horseshoe line for 109 miles taking in much of the wonderful North York Moors National Park. The route starts in the market town of Hemsley and heads across the heather clad moors, through woodlands and dales to reach the coast at Saltburn where it then heads south along the dramatic coastline for 50 miles along rugged paths passing through old fishing villages and pretty coastal resorts and towns to Filey. The Cleveland Way also passes through many features of history and heritage such as Hemsley Castle, Rievaulx Abbey, Mount Grace Priory, Whitby Abbey and Scarborough Castle just to name a few. The 21 mile railway line between Scarborough and Whitby opened in 1885, by the Scarborough and Whitby Railway but in 1898 after financial losses it was bought by North Eastern Railway. After the Second World War the line steadily declined and was closed as part of the Beeching cuts in the mid 60’s. The last train ran on 6th March 1965 and the rails were removed soon after but in the 1970’s Scarborough Borough Council acquired the track bed which is now a footpath and cycle track and apart from a few minor obstructions the whole line is open to public use. 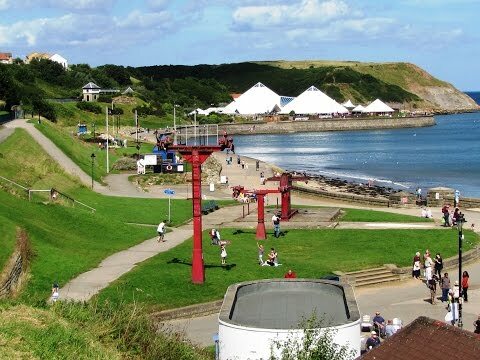 Scalby Mills is situated at the far end of Scarborough’s North Bay near the Sea Life Centre. The Old Scalby Mills is tucked into the cliffs where Scalby Beck meets the sea and is rather a quaint setting. The historic building built in 1771 originally housed the town’s first water mills and was rebuilt after a fire in 1821. At the turn of the 19th century it was converted into a hostelry and was surrounded by grassy slopes with open thatched shelters. During the summer visitors would walk or ride donkeys to this popular place where they could dance, have afternoon tea or something a little stronger. It is now a popular pub serving a variety of real ales and good wholesome food such as traditional Yorkshire beer battered fish with chips, meat pies, steaks, snacks and children’s meals. Optional: Before we start our walk we walk into Scarborough along the coastline of North Bay towards the castle and into the South Bay. We wander around looking at the attractions, the harbour of South Bay, Scarborough Castle and Picadore Gallery where you can have any of our photographs printed onto canvas. We continue into North Bay where we wander around Peasholme Park and The Sands complex then make our way back to Scalby Mills Road to start our walk. We park at the side of the road in Scalby Mills Road. We follow Scalby Mills Road round to the bottom to Scalby Mills and the pub, the Sea Life Centre and car park is further round to the right, and turn left to cross the bridge over Scalby Beck. We head forwards uphill on the Cleveland Way. We follow the Cleveland Way along the top of the cliff edge and we drop down into a dip and follow the sign for Cleveland Way Ravenscar 6½ back up onto the top and continue forward. We pass the coastguard station and mine shelter at Long Nab and keep heading forwards and drop steeply downhill and back up again onto the top and carry on forwards. We drop steeply downhill again and back up the steps at the other side through the trees. At the top we see a tarmac road on our left this is the road to Cloughton but we walk a little further and take the little footpath on the right down onto the beach for a break. We then make our way back uphill heading forwards crossing the Cleveland Way to take the tarmac track towards Cloughton. At the bridge before we reach Cloughton we pick up the old railway line and cycle track on the left and keep heading forwards. We come to a minor road and turn right and left to pass the old station tea rooms and carry on heading forwards. When we get to the main road at Burniston we cross the road turn left and take the track on the right to continue on the old railway line. When we come to the end of the track, at the start of some buildings, we turn left along the road at the end of the road we turn left and at the end of this road we turn right and then turn left down Chichester Road. At the end we turn right and left following the sign for Scarborough to Whitby Trailway. We keep heading forwards on the track going through the gates to cross two roads and then take the path on the left up some steps with a cycle ramp at the side. We head forwards bearing slightly right on a tarmac path, the path dips down and up into some trees. We walk through the trees which brings us to a road where we turn right along the road and then at the t-junction with the main road we turn right and then left at the Sea Life Centre sign going down the side of the Ivanhoe pub. We are now back where we parked our car on Scalby Mills Road. This is a moderate walk with a few steep inclines and declines along the cliffs which is mainly grassy paths. The old dismantled railway line is easy walking on a good level track. The North and South Bays are mainly level pavements. It is steep up into the town centre and up to the castle. The walk only is approx 8.75 miles allow at least 3¼ hours using OS Explorer Map OL27, North York Moors Eastern Area. Add approx another 5 miles to walk from Scalby Mills into Scarborough’s North and South Bays and back. Scalby Mills, Scarborough on the coast of North Yorkshire. From the A64, A170 or A171 take the A165 towards Burniston and Whitby. Take the road (Scalby Mills Road) next to the Ivanhoe Hotel sign posted the Sea Life Centre. Free roadside parking and there is a pay and display car park at the Sea Life Centre. There are no public toilets on the walk but there are ample public toilets with disabled and baby changing in Scarborough itself. For refreshments there is the Old Scalby Mills pub at Scalby Mills and two pubs at Burniston the Three Jolly Sailors and the Oakwheel. There are many shops, pubs, restaurants, cafes and takeaways in Scarborough.